The original eBook that explained the Mystery Method and published and sold directly by Mystery Method Corporation, the company which Nick Savoy and Mystery (Erik Von Markovick) founded together. When a new version of the book (see below) was published with a publisher this original eBook was taken off the market. February 2007: The Mystery Method: How to Get Beautiful Women into Bed: A repackaging of the same content that was published as a book by Mystery. January 2008: Magic Bullets: The manual from Love Systems which has the original tech in the Mystery Method embedded within its content. June 2008: Revelation: The latest eBook from Mystery/ Venusian Arts, including and improving on the original Mystery Method tech. "the only book you will ever need"
This book has been a god send for me.. I printed out my copy 6/23/07 i studied the book for a few weeks and used its principals to develop my own openers and dhv stories. Within a month I was dating 4 gorgeous hotties.. and going out to pick up new ones twice a week. I fell in love and ended up marrying the most amazing ever women that far surpassed my expectations in every way on 12/5/08.. and to this day when we reminisce about our courtship she remembers some technique's I used from this manual as some of the defining moments where she fell for me. i.e. taking her hand and throwing it away. The sequence of the model follows exactly what happens in a true "natural" pick up when everything "just goes right." Its all very learnable and easily applicable to use. You will get good results following this method. there is a lot of new products out there that pushes "inner game" and claim you need to do countless approaches and have no plan going in and just say what ever comes to mind.. this is ridiculous and counterproductive. The hardest part of game is actually going out and practicing.. the reason there is so many different products out there is because its easier to throw money at your problems and keep waiting till you have everything just right to go out. The other thing is as I developed myself as a pua i was always concerning myself with true having DHV's and it also caused me to develop my career and health I am far more successful now than I would have otherwise been without the knowledge in this book. I just truly didn't get what value was until I read its relationship in this book. all in all this is the best book on the fundamentals of the game. "All You Need to Get Started." The VA handbook and DVD set is really all you need to get started. Too many beginners want advanced game quick. "It costs 68 $, But is Worth It"
Personally, I would buy the VenusianArtsHandbook. It costs 68 $, but is worth it. Then do the newbie mission (open so many sets an hour, so many hours a day and so on). If you have a good foundation (consistent succes), then you can go on to the DVD's. 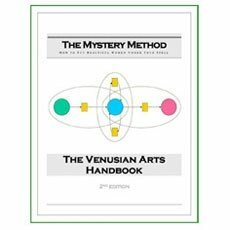 The Mystery Method "Venusian Arts Handbook" is the broadest-encompassing, most highly-structured, best organized manual I've ever come across. I've begun filling up the M3 model with the attitudes and routines from MM and other places, making it truly my style where I've taken the best stuff that works for me and incorporated it into my own. That's what this book encourages you to do, anyways. This is where the Handbook shines... it's a great fill-in-the-blank vessel for my other materials to ride in and integrate into. "The Best How to Manual"